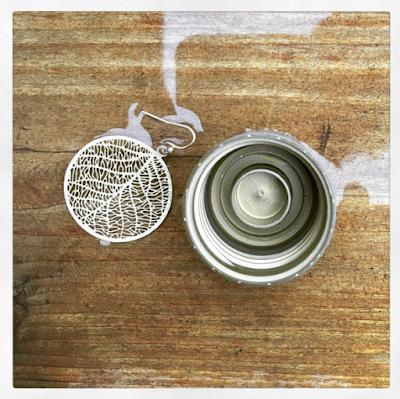 Today's pairing is a lovely earring and a bottle cap. I've got mine on a rainy deck slat. Lee's also got hers on a woody backdrop, so we're extra twinny today! Since we're talking about it, can I just mention another plus of #TwinTuesday, besides the well-documented brain benefits of novelty that I listed last week? It's the nurturing of a creative partnership. I've had many creative partners, including Lee. We haven't just done this quirky blog project together, either - we've done official research studies like this one. I'll be honest and admit that one reason I collect creative partners is because of my high inclusion needs. I'll basically follow you into the bathroom if you'll let me, just so we can keep talking and I can feel like I'm your friend. Sometimes, if you don't start strategically avoiding me, our conversation leads to a project or lesson idea we can collaborate on together. "Cool," I'll say. "Can I do that with you?" "Do you have any interest in working on this with me?" Sometimes people actually say yes, and in those cases, I almost always end up doing something better than I could have done on my own. So my list today is action items to nurture a creative partnership. I don't know if these will work for all fields (tell me! ), but they've worked in teaching and writing so far. Cultivate a Yes Response. If someone asks me to do something with them, I really just try to say yes. There's a caveat - I don't say yes if I know for sure the idea doesn't interest me. Like, say, "Will you work with me on revamping after-school detention?" That's going to be a big fat no. First, it doesn't inspire curiosity in me, and second, I don't even believe in detention. But, even if I'm just marginally interested or curious about an idea, I'll go with a yes! Or, at least a, "Tell me more about what you're thinking." I'll especially go with yes if there's an idea of how to do something differently than I've done the same thing before. Why not at least try the different way? Teach with the Door Open. Depending on whether or not you're a teacher, I might be speaking metaphorically here. In teaching, people have a tendency to shut their doors and just be in their spaces with their kids. I try not to do this all the time. Instead, let cool people see your work, and sometimes those people will want to join you in it. Full disclosure: this can backfire and those interlopers can be mean and/or obnoxious about your work. Most often, though, that's not what happens. Ask. I snagged my writing partner by asking what she was working on and whether we could get a coffee. The coffee ended with her saying, "How can we help each other?" And now we help each other. I can't believe it! And that's #TwinTuesday. Do we see the value added? I think we do.